Stories have been an essential part of my life since before I could talk. As my father was blind he would tell, rather than read me, stories to send me to sleep. As soon as I could talk, I became the 'teller of the world' for him, describing everything I could see (and some things I couldn't) as we walked together. Training with Ben Haggarty, one of the driving forces of the story telling revival in the UK, I have developed my own engaging and playful style. With a wide repertoire of world folktales, I offer workshops and performances in all kinds of settings and to all age groups. I give storytelling performances and run story workshops, matching sessions to the particular setting to enrich the curriculum. I have told stories in day centres for the elderly and for the mental health charity MIND. 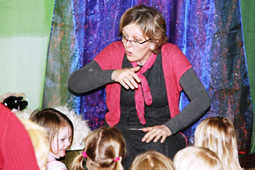 I am a visiting tutor, running storytelling workshops for the University of Herts Education department. I run staff training in storytelling for schools. "She is meticulous and thorough in her research and planning, but playful and spontaneous in her delivery."